One of the very best purchases that I have made this year is this REN Relax and Replenish Set– normally a $165.00 value, this set is being offered for a mere $49.00. 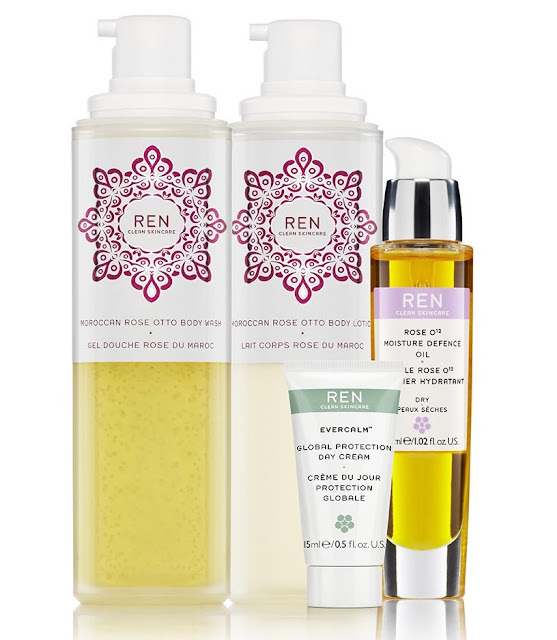 I have used REN products for many years, and these three Rose treasures are among my very favorites. This makes a great gift for yourself or for people on your gift list. The value is so incredible that I am going to pick up a few more sets! REN's Relax & Replenish set contains daily hydrating beauty must-haves. Our award-winning Moroccan Rose Otto Body Wash and Body Lotion along with our best selling Evercalm Global Protection Day Cream and Rose O12 Moisture Defence Oil will leave you with beautiful, healthy and radiant skin. Is that oil for face or body? I have two of these sets sitting in my dining room ready to be used or gifted. While I would love to use it myself, I am not overly fond of rose scent (and a little wary as I am allergic to roses). I have been able to use some products with rose in it, but not sure about a triple dose. How strong is the scent and how lasting? Thanks! The oil is for the face, and I don't find it overpowering, but you might want to try a pump of it to see if it bothers you. Once it sinks into the skin the aroma disappears fairly quickly on me. The lotion definitely isn't overpowering, and it's for the body. It is a truly lovely set, and the price is insane– so it would be a great gift, if you don't think that you would use it.